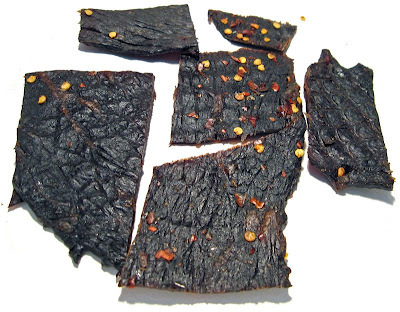 Pacific Coast Jerky Factory is a brand name belonging to KMB Foods, Inc., of Arcadia, CA. KMB also owns the Cactus Jacks, and Cattleman's brand of jerky. They also private label jerky for several other companies. Read my previous review of their Original variety. This is a slab-style jerky, a different meat than that used in other brands I've reviewed including, Buffalo Bill's Dead Meat, Oh Boy! Oberto Thick Cuts, and Jawbone Beef Jerky. Beef, water, salt, pepper, papaya, brown sugar, garlic powder, seasoning sauce (carmel, water, carrots, onions, celery, parsnips, turnips, salt, parsley & spices). The first thing I taste from the surface of these pieces is a meaty, oily flavor. With some sucking I can get some salt. I can feel some slight spicy heat brewing. In the chewing, what I taste first is some more saltiness, then some light natural meat flavors, and a slight bit of sweet. Well after a couple of pieces, this jerky is hardly hot. I started with a piece with a lot of chile pepper flakes and seeds, and then moved on to a piece with nary any at all. Both didn't offer much heat. On my hot scale, I'd rate this as mild, but I think many others might see it as mild-medium. 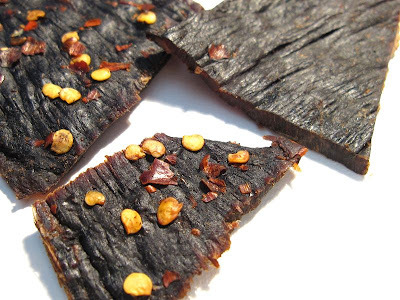 In comparison to Pacific Coast's original variety, this jerky tastes exactly the same. The only difference seems to be the visible sprinkling of chile pepper flakes and seeds. But that sprinkling doesn't add much to the flavor. It perhaps has more visual impact than taste. And like with that original variety, I think the saltiness is the strongest flavor component. But it's not really that strong, probably light-to-medium in intensity. 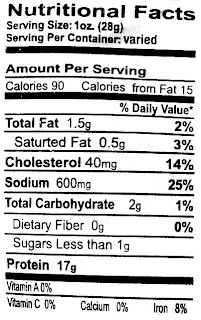 The seasoning sauce listed in the ingredients is also quite noticeable, and that's what probably provides the most flavor interest in this jerky. It's a pretty tasty blend of flavorings, and seems to work well with this meat. The natural meat flavors are noticeable, but quite light, and I think they sit behind the saltiness and seasoning sauce. There's also an oily flavor in this that's quite noticeable on the surface of these pieces. Overall what you're going to taste in this is a meaty, oily flavor initially on the surface. In the chewing, you're mostly going to get a saltiness, and a seasoning blend. The meat flavors gets drowned out by the salt and seasoning, but are still enjoyable. This is largely a dry jerky, with a good deal of flexibility. The pieces require some effort to tear apart, even with the grain, and range from moderately-easy to tough in chewing. It was thicker sliced piece that was quite tough. The chewing texture starts out feeling stiff, and hard, with a bit of rubbery resistance. With some sucking and gentle biting it compacts down, and chews down into a soft mass in about 20 seconds. At that point it takes on a steak-like chewing texture, similar to medium-well. I don't get anything gummy, mushy, or crumbly. I did encounter several pieces with visible streaks of fat. Most had fat on the edges, but I found another piece with streaks running in the middle. That's probably gives this jerky its oily flavor. But I didn't find any tendon or gristle, however I did some a fair amount of chewy sinews. In terms of clean eating, these pieces leave behind a noticeable layer of oil on my fingers, but not so much that I have to lick them clean. Tearing pieces apart, however, doesn't seem to drop any fragments of meat. For general jerky snacking purposes, at this $1.71 price per ounce, it seems to provide a decent value. I'm getting an average amount of snackability from its satisfying flavor, but that snackability is compromised by the tougher tearing and chewing in some pieces. As a hot variety of jerky, at this same $1.71 price per ounce, it's a poor value. I don't really pick up much "hot" at all. In fact, I'd say none at all. If you're looking to get a fair amount of heat from a jerky, spend your money on a different brand. My biggest issue with this Hot variety from Pacific Coast Jerky Factory is that it isn't hot. It's not even "medium". It's mild, not spicy at all. But if you put that aside, it's still a snackable flavor. Actually the flavor is good I think, with its light meat flavors, saltiness, and seasonings. But this particular review sample I had was significantly more tough to eat than the Original variety I reviewed before. That toughness brought the snackability down. My beer recommendation for this, a brown ale.